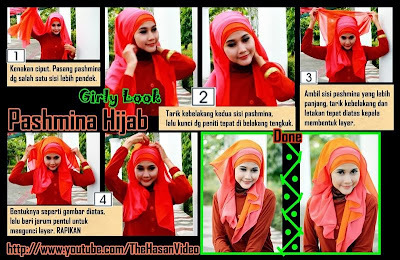 Tutorial Hijab Pashmina Simple - Here is an easy way to don Pashmina Hijab... This style suits much for those who like the simple thing yet remain to be full of enchantment. It needs no any brooch but emphasizes the drapery effect of its loose style. It matches for any outfits indeed. I bet you won't miss applying this style in the upcoming Ramadhan (Ied Fitr). Or anyone, perhaps, wants to practice this style and have a chance of getting an ANDROID TABLET freely just click HERE. Well, hope you'll have crush on it.